File photo of Minister Murphy. THE GOVERNMENT HAD built less than half of its planned social housing for 2018 by the end of September, new figures show. The Rebuilding Ireland Q3 social housing building report shows that a total of 2,369 social housing units had been built across the country by the end of September. This figure included 1,764 new builds and 605 local authority voids being brought back into use. This amounts to less than half (48%) of the yearly target. The government set a target of 4,969 new social homes to be built by the end of the year. 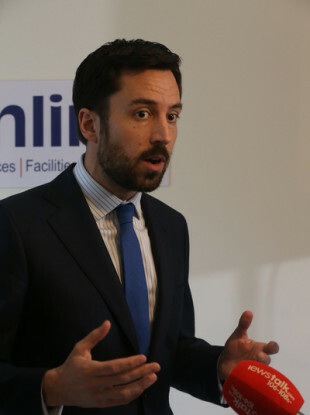 In a statement released with the figures, Housing Minister Eoghan Murphy said that “good progress” was being made across social housing delivery streams. “Our targets are ambitious for 2018 and we are working hard to achieve those targets,” he said. Murphy said that as with previous years, delivery of actual units “is weighted towards year end”. “Delivery is being carefully monitored at Local Authority level and all stakeholders are mobilised to drive the earliest completions possible,” he said. Commenting on the figures, Sinn Fein housing spokesperson Eoin O Broin criticised the government and said that the number of completions was far behind target. O Broin said that the Department had only reached 35% of its target for new builds. He said that the 605 voids should not be completed as they are not new units added to the housing stock. “The Department of Housing must stop including voids in the quarterly output report as they are not new additions to the social housing stock. The Department included 605 voids in its output figures today,” he said. Labour housing spokesperson Jan O’Sullivan also criticised the government, saying that the Housing Minister needed to let the public know why less than half of the proposed new builds had been delivered. “Given the scale of the crisis in front of us now, this really isn’t acceptable,” he said. The figures showed that the government was on the way to meeting its targets for Housing Assistance Payment and Rental Accommodation Scheme tenancies by the end of the year. Both HAP and RAS are used by government as forms of social housing delivered in conjunction with landlords in the private rental sector. There were 14,275 such tenancies created in the first nine months of the year. As well as this, Murphy stated that housing production had been ramped up over the past year. He pointed towards 2,652 units in the final pre-construction stage and about to go on-site – an increase of 68% on the previous quarter. Email “'This isn't acceptable': Government delivers less than half of planned social housing in first 9 months of the year”. Feedback on “'This isn't acceptable': Government delivers less than half of planned social housing in first 9 months of the year”.